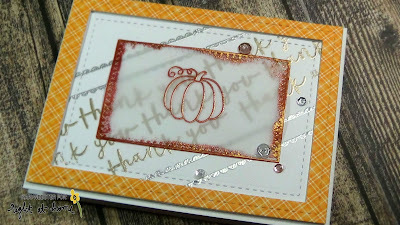 Today, I am here to share this card showcasing the popular set from Right At Home called Grateful Heart. It has been one that I have used a lot over the past month. It just has so many different and great images and sentiments for the fall season! Today, I wanted create a card design with multiple metallic embossing powders, so I created a background using the thank you sentiment first, and stamping it with my Versa Mark ink, and embossing it with Liquid Platinum embossing powder. 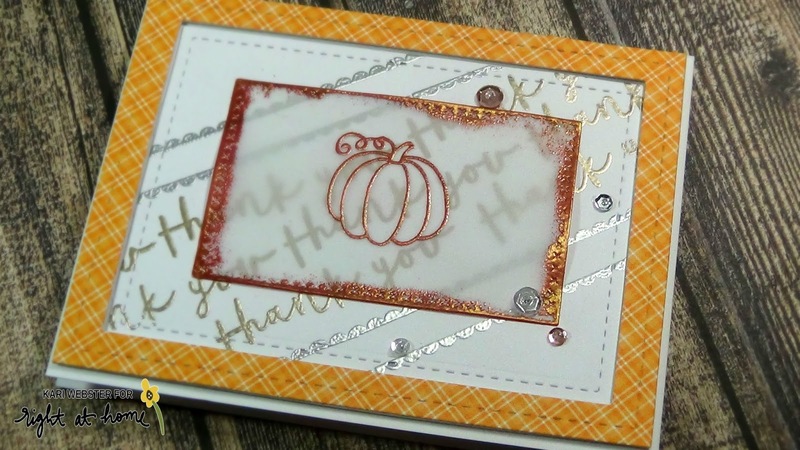 I wanted to give a finished edge or border so I used the Holiday Ribbons stamp set to create this look, and I embossed it in Silver embossing powder. 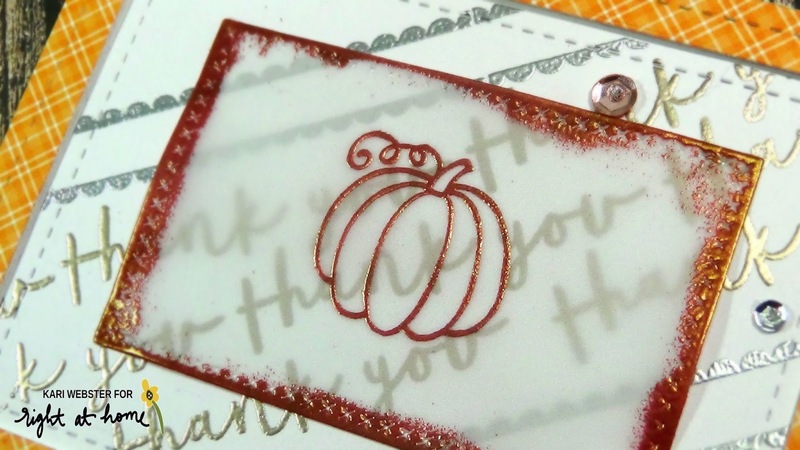 Then, I really wanted to incorporate some Rose Gold embossing powder, so I stamped the pumpkin from the set onto a piece of vellum that I die cut with a cross stitched rectangle die. I also wanted to give it a distressed edge and bring out more the Rose Gold embossing powder, so I coated the all four edges of my vellum piece and them embossed it with that gorgeous powder. I die cut my main panel using the rectangle frames from the Find The Beauty die set, and I tape them together to also create a frame. I also did the same with a piece of pattern paper to compliment the embossing through out my design. I put all of my pieces together on my A2 white card base, and popped up my frame. I felt like I need something to finish off my card, so I added a few rose gold, sparkling clear and silver sequins. And, that completes my card for today! I love all of the different embossing looks on one card. Thanks for stopping by today!! Be sure to visit the Right At Home Shop as the awesome Fall and Holiday is now available, AND there are coordinating dies for a lot of the sets for the release available now too! !